Around 30 people living nearby have written to the council and started a petition to oppose the application by Sunnyfields, which already runs two nurseries in the borough. Mum-of-two Natalie Rooney, aged 37, said: “We think there will be traffic problems because of all the parents dropping off and picking up their children. “We think there will be noise problems because the children will be playing outdoors." "We are also worried that paedophiles will be attracted to the area to be close to the nursery. "The fact is it will be a 52 children nursery with strangers dropping off and picking up their children, and this is a closeknit community, and the upshot of that is we do not know who will be sitting outside in their car." Hmm. But at least the paper would play down such nonsensical fears. Wouldn't it? 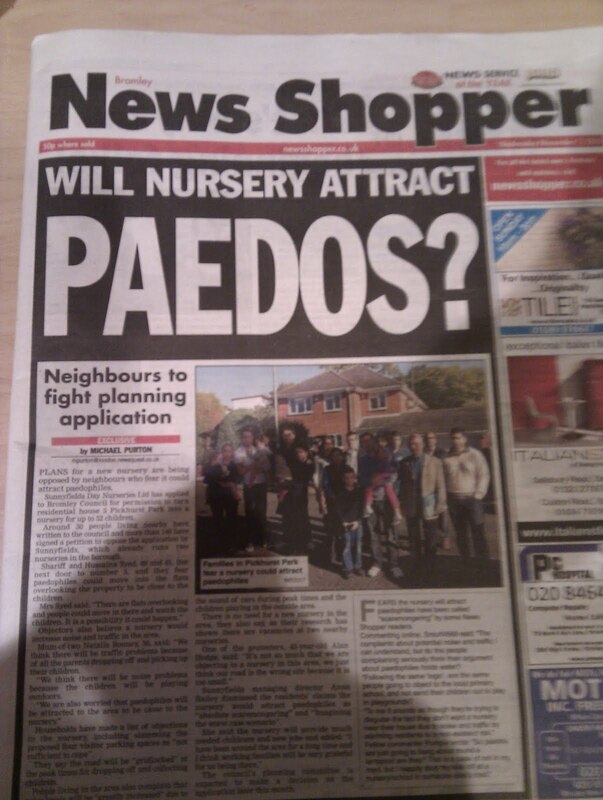 I would be much more worried about the kind of people attracted to the editorial desk of the Bromley News Shopper. That is the craziest thing I've seen in a while. I have lost another ounce (of my ever dwindling supply) of faith in humanity. My boss comes from Bromley. Daily Mail reading, xenophobic, elf n' safety and PC gone mad...he's like some kind of caricature! So what it boils down to is: the existence of children may attract paedophiles. Children, therefore, should not exist. Or at least, only exist in complete isolation from the outside world and certainly not be permitted to congregate in nurseries, or schools, or playgrounds. Ban the lot of them! That'll show the paedophiles. Lets see if this gets picked up by the Main stream papers and is twisted even more. This is surely enough of a story for the Star/Sun/NOTW to name a random, innocent local man as a child abuser and claim he lives too close to the proposed site. Local papers used to be a good source for proper reporting. However these days they are increasingly becoming somewhere that a local Journalist who can't be bothered to build up a proper reputation decides they will sell out and report crap like this in order to be spotted by the tabloids. This isn't universal of course, my local is quite fair with its coverage...when there is something worth reporting on I mean...it is a weekly and does struggle to fill in articles between the adverts these days. This is how journalists start out in their early careers before they go on to work for the Daily Mail.